Are you planning to install quartz kitchen countertops in Baltimore, Maryland, Northern Virginia, DC or the neighboring areas? Quartz is making a name for itself, quickly becoming the most requested material for kitchen countertops. Impressive resilience, affordable nature and the vast array of colors are just a few qualities that make quartz a valuable countertop material. Keep reading to learn 7 surefire reasons why you should choose quartz for your kitchen countertops installation. Ready to schedule a free estimate or have questions for our team? Give us a call today at 410-712-0601 or click below to complete our online request form. If you’re on the fence about selecting quartz for your kitchen countertops, we encourage you to explore its high-performance and low-maintenance nature. Customers who install quartz countertops are blown away by the durability and ease of keeping them clean. For years, granite has dominated the market because of its stunning natural stone appearance. But customers are starting to discover the hidden gem of stone countertops, finding a winner in the quartz vs. granite debate. And requests for quartz countertops have been on the rise ever since. Quartz is 93% natural stone and slightly engineered, simply to transform the material into a functional countertop slab. The striking appearance isn’t forfeited for the enhanced performance of quartz, making it a well-rounded kitchen countertop solution. If there is a specific natural stone you desire for kitchen countertops, chances are there is a quartz material designed to look identical but function more efficiently. Ask us about quartz alternatives to marble, granite, travertine and more. In terms of value, quartz truly delivers when you compare the broad benefits with its very affordable cost. In fact, quartz is the #1 alternative to granite countertops because it provides that natural stone appearance without the high-maintenance demands. Quartz may not compete with alternatives like laminate when it comes to price, but it delivers a longer life expectancy with higher quality materials. You’re truly getting what you pay for: heavy-duty countertops designed for a lifetime of daily use. We provide our customers with the very best products, and offer multiple quartz manufacturers to improve our ability to meet your kitchen’s specific needs. Each manufacturer has distinctive qualities, affordable prices and benefits to offer. No need to fret over sacrificing your ideal color palette for durability, because you can have deluxe performance and style with quartz kitchen countertops! Our diverse selection of quartz manufacturers allow for creative and artistic variation in countertop colors. If you’re still unsure of color, our design team can help you select an optimal hue that complements the overall design of your home. From neutral granite-like hues to vivacious popping hues to even marble designs, there are no color limitations with quartz. Two of the greatest features of quartz that make it desirable for home use are its nonporous and nonabsorbent qualities, meaning chances of bacterial growth are hugely minimized. During food prep and even from regular contact, bacteria can leach into other porous countertop surfaces such as unsealed granite. Quartz allows you to maintain a healthy, more hygienic kitchen atmosphere. We understand that you want unique kitchen countertop designs that define and exude the personality of your home. Our ability to customize quartz countertops makes it easy and affordable to get that personal touch. Material Thinning: Get a truly unique appearance by installing a thinner version of quartz. If you’re ready to speak with our team & schedule a FREE estimate, give us a call today at 410-712-0601. You can also click here to complete our online request form. 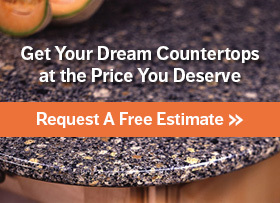 When you buy from Express Countertops, you can expect premium products and top-notch service. We’re dedicated to providing our residential and commercial customers with the best countertops available in Maryland, Northern Virginia and DC, standing behind our 7-Day Installation Guarantee. For quality service and stunning countertops, give us a call today!